HOW DO I TELL IF MY PET IS DEFICIENT IN SOMETHING? 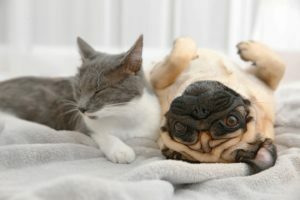 Even if you are feeding the best, most expensive pet food on your vet’s shelves, even if you follow BARF, even if you diligently home cook every meal, your pet might be still deficient in certain nutrients. Cat and dog deficiencies are a real problem. There are so many factors to take into account. How was the food manufactured? How was it stored and transported? What is the quality of the raw materials/meat used? Does your pet have parasites? (These can very quickly deplete nutrients.) Even an overweight dog can be malnourished. A pet who is not getting enough Omega oils might suffer from allergies, yeast infections, inflammation, weakness or slow growth. One of the most common dog deficiencies is a Zinc deficiency, but certain breeds, like Huskies are extremely prone to it. Suspect Zinc deficiency if your dog has skin lesions, hair loss and a scaly, crusty skin. Then, make sure you choose a supplement which uses chelated Zinc (where it is bound to an organic molecule like an amino acid) and the correct amount, or else you might cause more problems than it solves. Check with your vet if in doubt. Many dogs aren’t eating enough fat. One of the results of this is that Vitamin A can be deficient. Signs of too little Vitamin A in the diet are a weak immune system, night blindness and a dry skin. Again, be wary of giving too much – fat soluble vitamins like this are not easy to get rid of when given in excess and can cause problems. Humans can produce their own Vitamin D using sunlight on skin via a precursor called 7-DHC. Dogs have low levels of this precursor and thus can’t produce enough Vitamin D3. Too little Vitamin D3 can result in various bone and joint problems. Again, D3 is a fat soluble vitamin so too much of it can also cause serious problems, like a Calcium:Phosphorous imbalance. One of the most common cat and dog deficiencies is Anaemia, a shortage of available Iron. If your pet is suffering from this, you will notice a general weakness and lethargy, dark stools, pale gums, depression and a tendency to get sick often. Iron deficient pets can often be found eating strange things like soil or kitty litter. Your vet can do a simple test to confirm. Fixing this is as easy as adding Iron to the diet in some form or another. Be careful – overdosing is serious! Vitamin B1 (Thiamine) is quite commonly deficient in cats, but not often in dogs. Symptoms are excess salivation, weight loss and various neurological symptoms. Lack of Vitamin B2 gives rise to stunted growth, eye problems and heart problems. Addition of leafy vegetables or a supplement will help this. Vitamin B6 is very important. Too little can have very serious effects – epilepsy, kidney damage, allergies. The addition of sweet potatoes and peanut butter to the diet helps. Taurine is an amino acid (building block of protein). Dogs can make their own, but cats can’t, so it HAS to be part of their diet. Too little can cause blindness, digestive problems, heart failure and death. Commercial cat foods contain Taurine, but supplementing a home cooked or BARF fed cat is a good idea. It is very hard to overdose on Taurine, so rather too much than too little. Do you see what I mean when I say that nutrient deficiencies can be very real and sometimes very dangerous? Even the lack of one essential nutrient in a pet’s diet can stop your pet’s body functioning correctly and lead to a host of problems. How, K. L., H. A. W. Hazewinkel, and J. A. Mol. “Dietary vitamin D dependence of cat and dog due to inadequate cutaneous synthesis of vitamin D.” General and comparative endocrinology 96.1 (1994): 12-18.